Happy almost Hanukkah (Chanukah, Hanukah, whatever)! Anything on your wish list from Hanukkah Harry or Santa? I really want one of these this year. And one of these too. And maybe one of these. But I actually already got one thing on my list- I must have been really good this year! What’s that you say? Jews don’t have a naughty and nice list? Hmmm. There goes that theory. 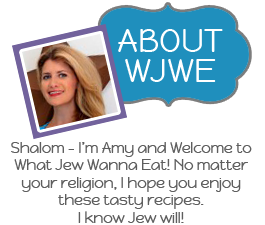 Well either way here is my first night’s present in advance- my very own WJWE business cards- it’s business time! Jew likey? I’m a fan. First thing I did when they came in the mail, of course, was make it rain WJWE style and then swan dive into pile of WJWE cards. It. Was. Glorious. Then I picked up my mess and made some latkes- and you thought I wasn’t good this year! Now that I live in Texas, I am pretty heavily influenced by tasty Texan foodie delights such as queso, brisket, breakfast tacos, and of course queso. Mmm queso. So when I thought about how to jazz up the traditional latke, I immediately thought Mexican. Besides my residence close to the border, my former roommate back in NYC is half Jewish and half Mexican and she turned out pretty amazing, so surely it could work for a latke! An idea was born. Though there is no queso in sight, there is not a chance these babies will last even one round of dreidel come Hanukkah time. Need a dessert to go with your fried potatoes? I’m glad you asked! 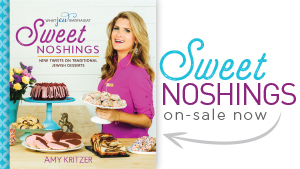 I have a super awesome Hanukkah inspired dessert or two coming up in the next weeks. Can’t wait to share! 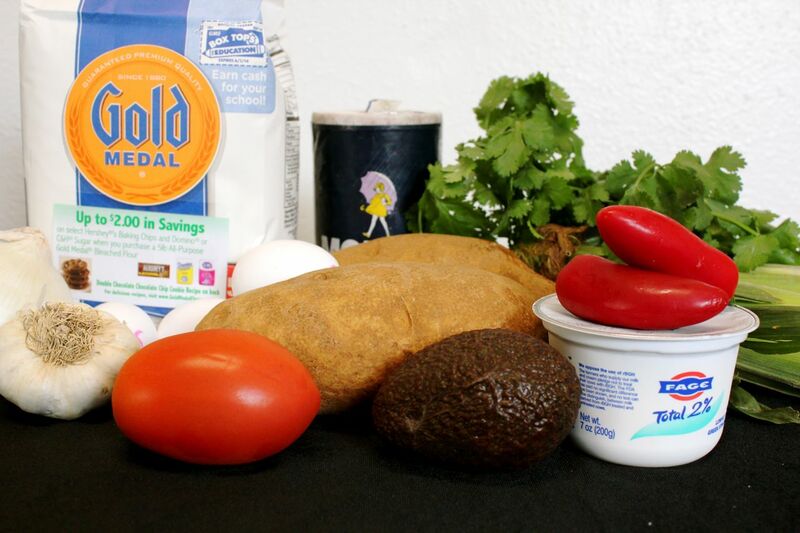 Here is all you need for your own Mexican latkes. And check out a bit of our new apartment! (Well one white wall at least.) Should my beloved Luke Perry poster go on this wall perhaps? I made an avocado cream and cilantro Greek yogurt as toppings too! First up, the most annoying part of latke making- the grating. Peel your potatoes and grate into a bowl. Last year I used a food processor, this year grater. I think I need a bigger grater. While you are on a break from grating, cook up your corn. Just put the corn in cold water and bring to a boil, making sure the water covers the corn enough but not so much it will boil over. 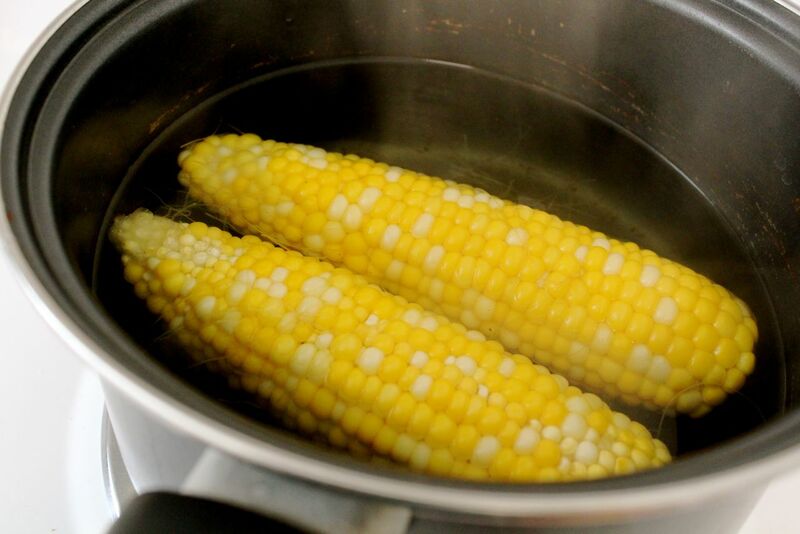 When the water boils, your corn is done- magic! 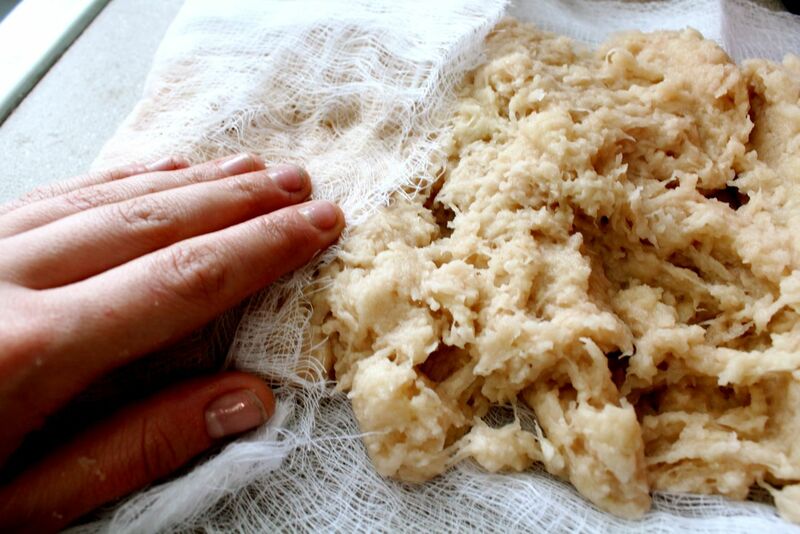 After all your potatoes are grated, squeeze excess water out with cheesecloth. This is very important or your latkes will be mushy and you will ruin Hanukkah! Well maybe not ruin, but pretty close. Then mix together with minced garlic and diced jalapeno and onions, corn, flour, eggs and salt. I used red jalapeno because it was a new find for me in our local market. You can use green- they are actually the same thing, but red are more ripe (just like bell peppers!) and therefore harder to find sometimes. Red ones are also less spicy. You learned something today! Now heat up your oil in a pan- I used vegetable oil. Make sure your oil is super hot- this is essential for a crispy latke! Put spoonfuls of latke batter into the oil and squish a bit with your spatula. Flip once after they get all brown and tasty looking. Man oh man. 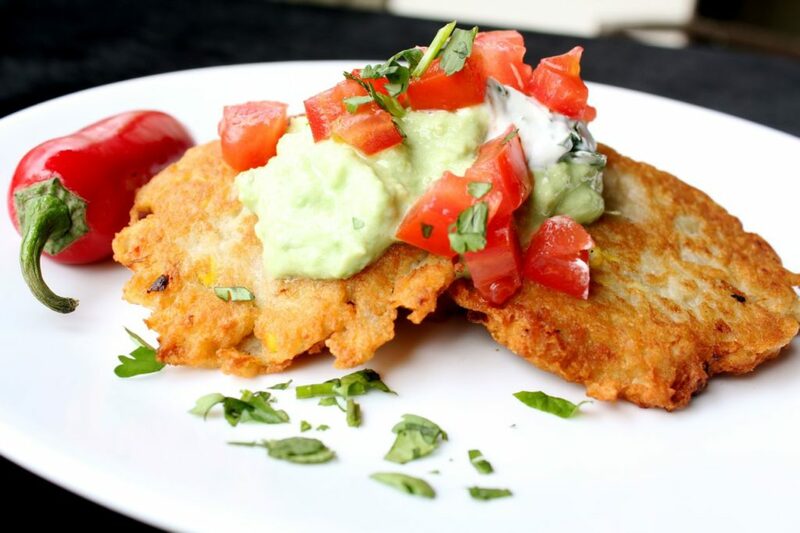 While your latkes are cooking, you can make the avocado cream sauce (inspired by one of my coworkers). Combine one large avocado, a tablespoon of Greek yogurt or sour cream, salt, pepper, minced garlic, and enough milk to get the consistency you want. Again, I like to use Greek yogurt because of the added protein and clearly the healthiness of this product negates eating deep fried potatoes. Before you know it, there will be latkes abound! Make sure to blot them off on a paper towel to remove excess oil before serving. Serve with avocado cream, cilantro Greek yogurt (just mix chopped cilantro into Greek yogurt or sour cream), diced tomatoes and more cilantro. You could top with some extra corn too for even more color! 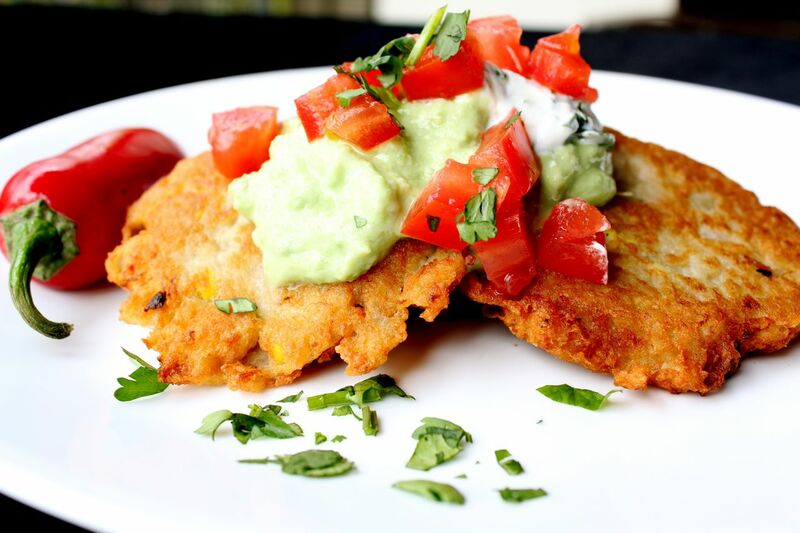 Mexico meets Hanukkah with these Mexican Potato Latkes! Start with making your avocado cream sauce. 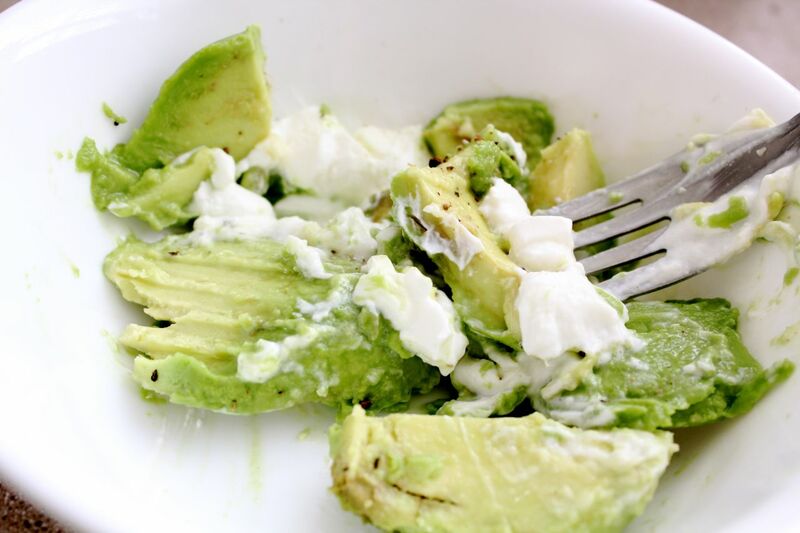 Combine avocado and Greek yogurt, then add lime juice to get the consistency you like (saucy). Add in minced garlic and salt and pepper to taste. Set aside. Put corn stocks in a pot of water, bring to a boil, and your corn is done! Drain and cool. Remove from stock. After peeling and shredding potatoes using a food processor or hand grater, place in a bowl of water and let sit for 10 minutes. Then, drain water through a sieve placed over another bowl. Let water sit so starch can settle to the bottom. 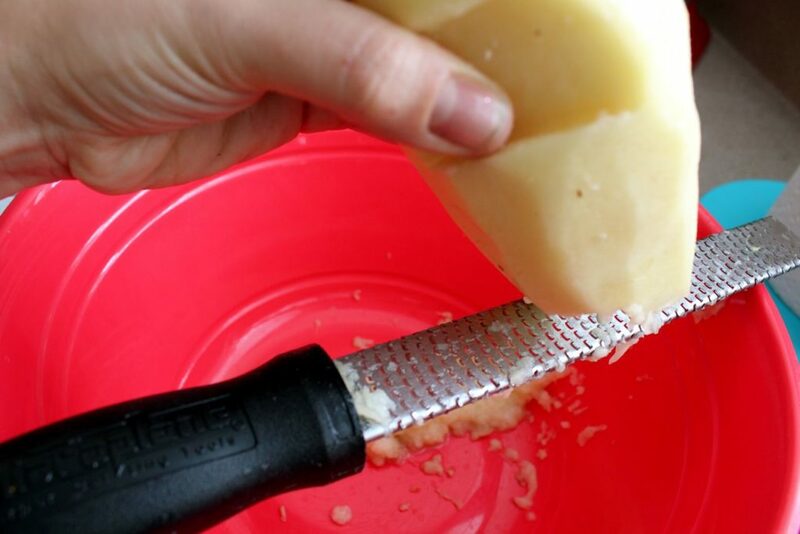 Wring out potatoes with a cheesecloth or towel, removing all moisture. Drain water from bowl, reserving starch. 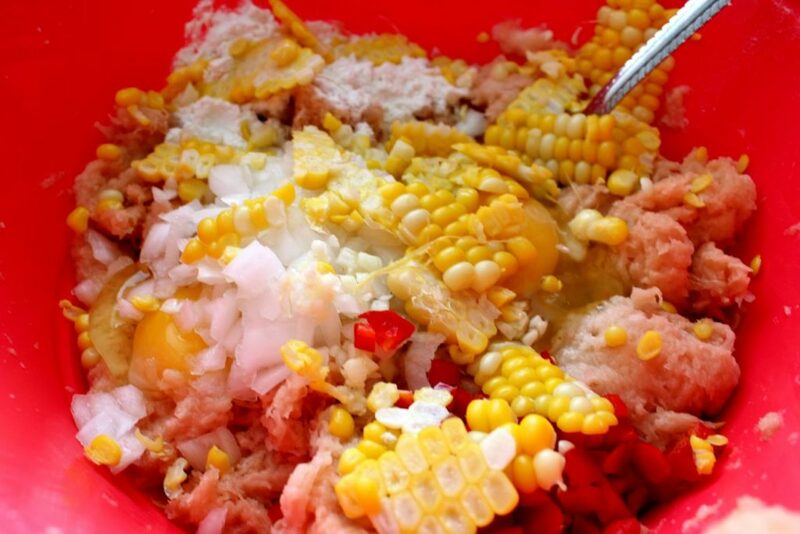 Mix potatoes, onion, jalapeño, garlic, corn, eggs, corn, flour and salt together in a large bowl. Add in starch and mix that up. Heat oil in a large pan over medium high heat until the oil is hot. Drop large spoonfuls of the potato mixture into the oil in batches, and flatten them down to form ½ inch patties. Brown on one side, about 2 minutes, and then flip and brown the other. Place on paper towels to absorb any excess oil and sprinkle with more salt. Serve hot with avocado cream, cilantro and sour cream! Felicitaciones! Muy bien hecho. Que bueno! Happy Chanukah from your biligual bubbe! Gracias Bubbe-cita! Te amo mucho!! Amy, This Bubbe gets such nachas from your site. Thanks for so much fun. Aw thanks, Diane! Great yiddish word! Wow. This recipe looks amazing. 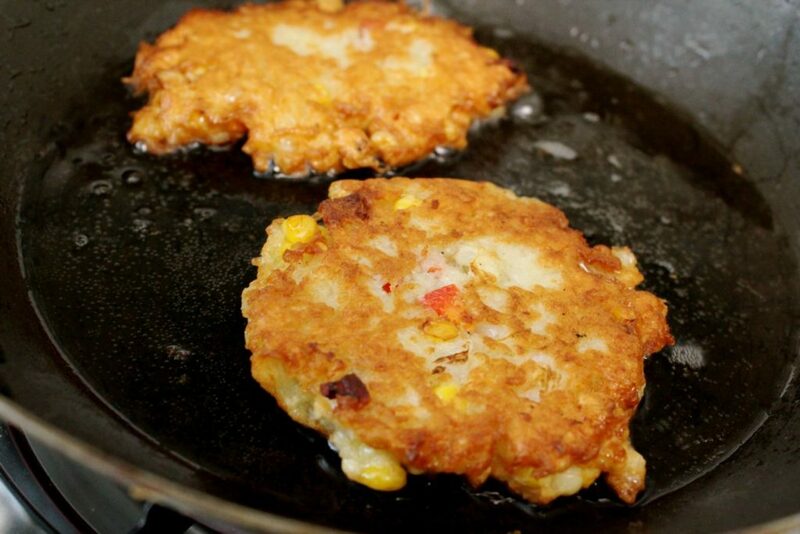 I’ve been doing latkes for years but never came across a recipe from Texas! Awesome! Ay Caramba! Oy gevalt ! it’s a machiah! This displaced Californian Jew loves the marriage of cultures. Thank you! Bwahaha this is the best comment ever! Thanks! That’s not a grater, it’s a zester. It has a different name though. I saw it on The Chew. This is an incredible recipe, no matter how you get the potatoes grated!!! I’m making it tomorrow night and I know my husband will love it. Thanks for sharing such yummy food. But I agree I should get a bigger grater for my potatoes- it’s on my Hanukkah list!! Let me know what your husband thinks and thanks for reading! This goy Texan living in Manhattan can’t wait to get back to The Lone Star Start tomorrow and make this delicious treat with his mama. Mazel! Yee haw! Hope y’all enjoy! They won’t be quite as crispy as russet potatoes, but they will certainly be tasty! Thanks! You could totally veganize these without the cream/yogurt! 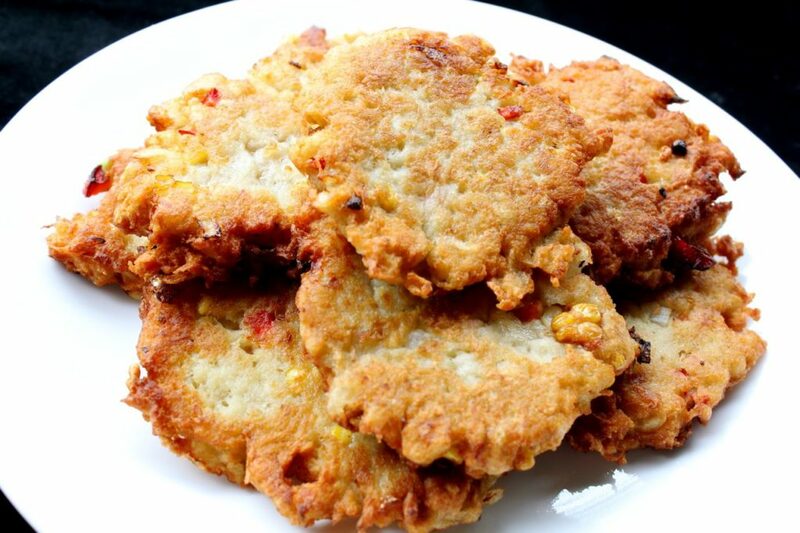 Latkes look delicious and will have to try out! They most definitely do NOT go with brisket, however, as suggested in the cover story. 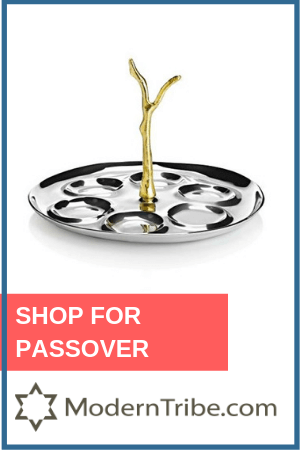 For a Jewish cooking website, it would be good to at least acknowlege a pareve version for pairing with meat. My mistake – you did not write the MSNBC story that made this inappropriate suggestion. No worries, Carl! 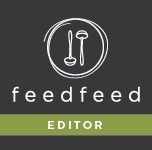 In my initial interview for the Bites article I actually mentioned omitting the sour cream in the condiments. You could just top with guacamole or fresh avocado instead. Happy Hanukkah!! I think I’ve looked at this about fifteen times since you put it on your Daily Candy vote post. These are amazing. Husband is intrigued (although refuses the avocado part) and these are a must-try. Thanks! 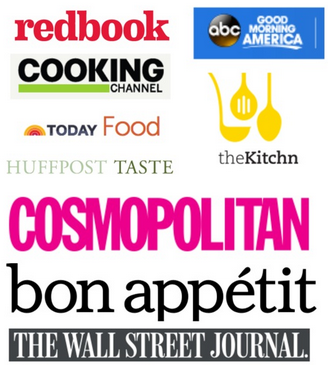 Thanks- this is definitely one of my most popular recipes- it was featured on The Today Show’s food blog! Is he not an avocado fan? I think the avocado makes it! Thanks! I enjoy latkes all year long myself. I want these so hard right now! Bwahaha no need to wait until Hanukkah rolls around! Oh my goodness these look SO DELICIOUS!! I am making them as soon as I can purchase all the ingredients!!! Thanks! Let me know how they turn out. Tov meod! Latkes are such a great palate food to play with.So many taste spins. I’m diggin’ your recipes. Thanks, Kerry! 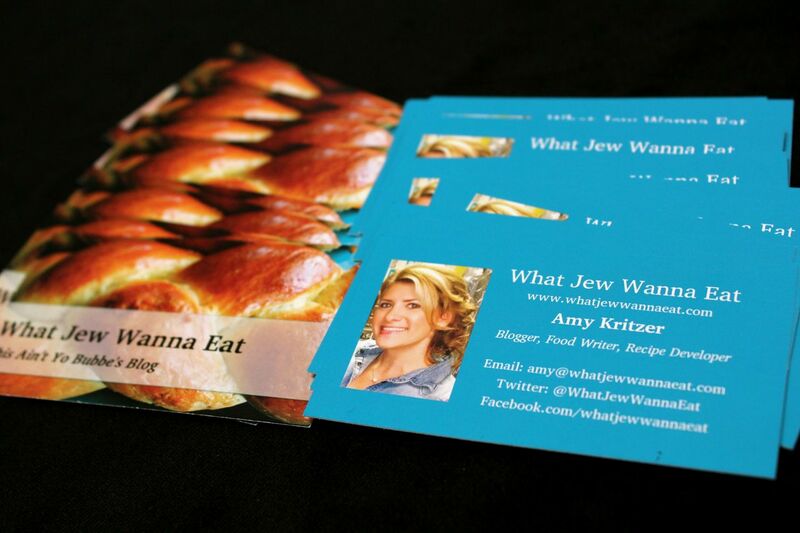 Oh yes you can be any religion and appreciate Jewish cuisine. Love how you put it! Amy as I mentioned I’d only just found out my birth Mum is Jew, I look back on my comment & wonder have I indeed been guided to your site?? This new discovery has indeed been amazing & now I truly feel I fit in some where…thank you & I’ll keep you posted if that’s ok? ?